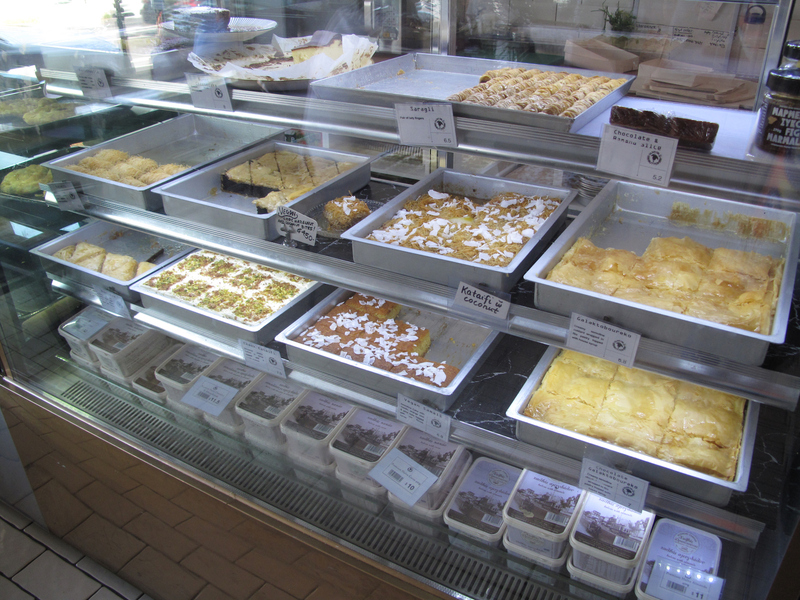 Outside the western suburbs, I can’t think of a foodie strip that is closer to the CTS heart than Lygon Street. 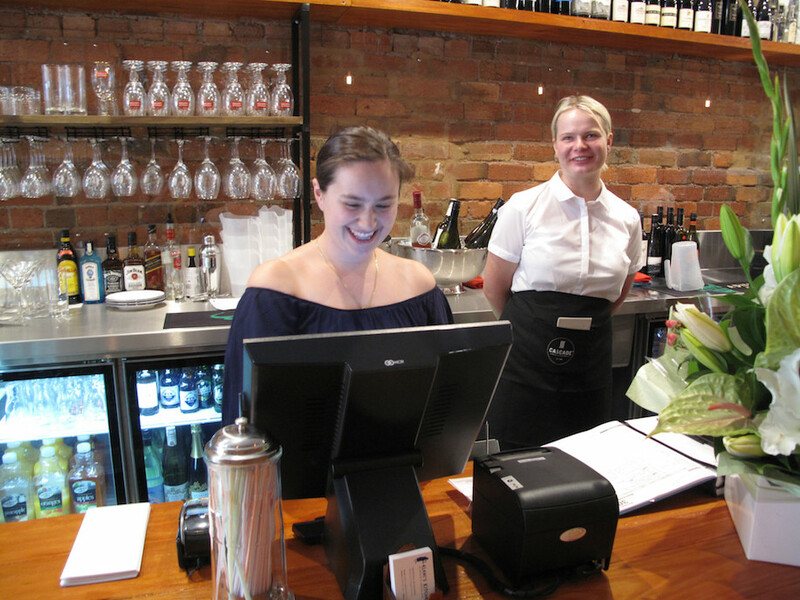 No, no – not the Lygon Street adjoining the Melbourne CBD. We walk a fair whack of that thoroughfare every week while on kung fu duty. 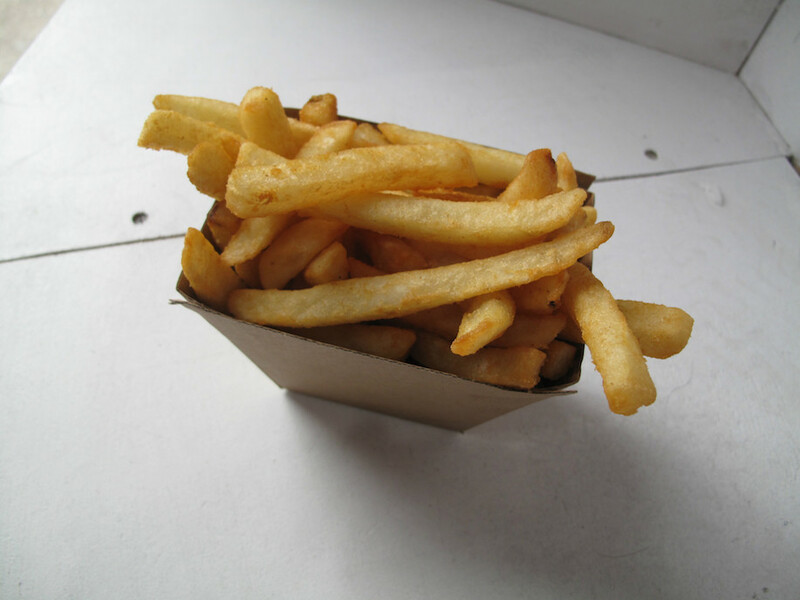 Very, very rarely to we feel the urge to linger for eats purposes. 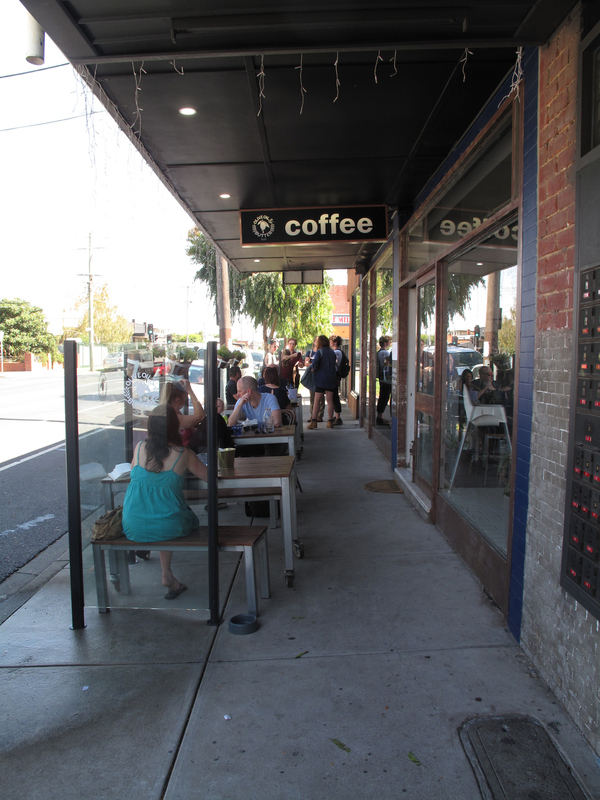 And, no, not the Lygon Street that runs north there past Melbourne Cemetery. But the Lygon that narrows as it enters East Brunswick? That be home, after all, to such previously covered delights as Teta Mona, Mankoush and Moroccan Deli-cacy – even if the latter is apparently entering times of change and new management. So we are very happy to accept an invitation (see full disclosure below) to dine at Xenia Food Store, the luscious and intriguing FB pics of which we have been noticing with lust ever since it opened. 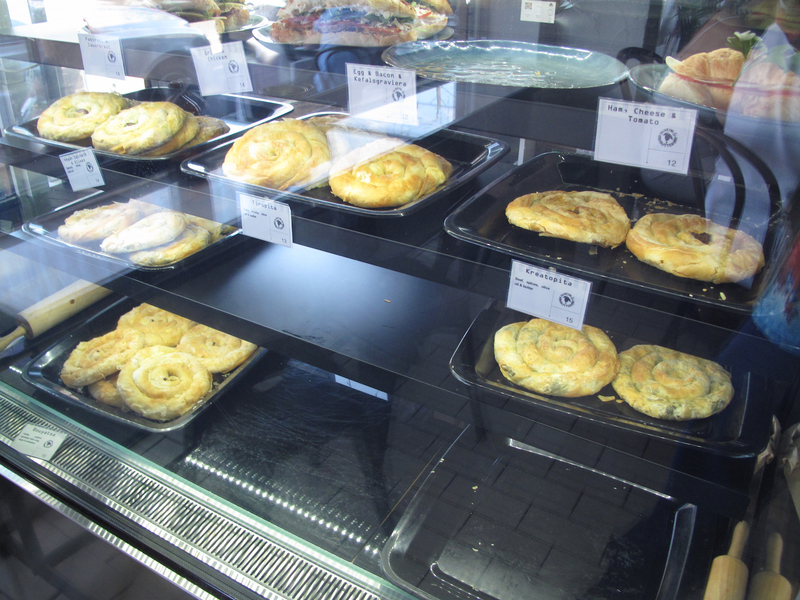 Those pictures have me primed for down home, home-style food of the kind not often found in restaurants. 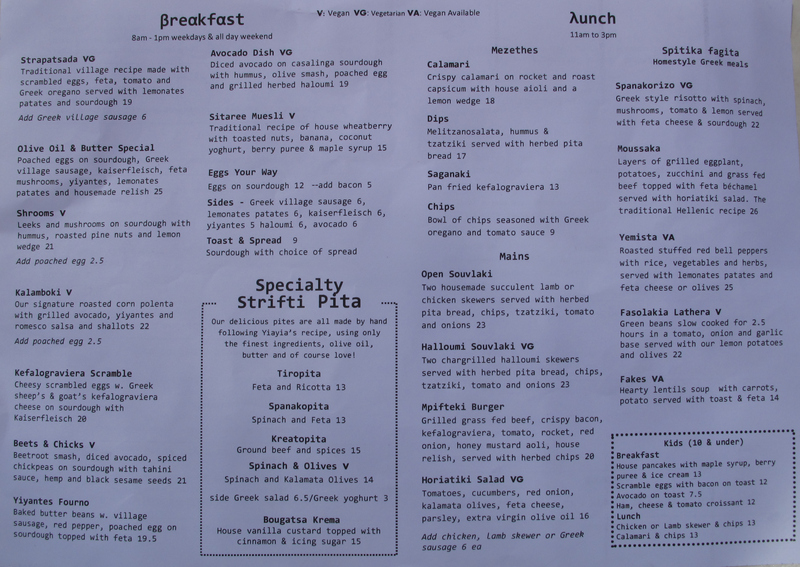 So, as we take our seats at an outdoor table in the blazing Saturday sun, I am surprised by the menu’s listing of such familiar fare as saganaki, chicken skewers and lamb pitta. 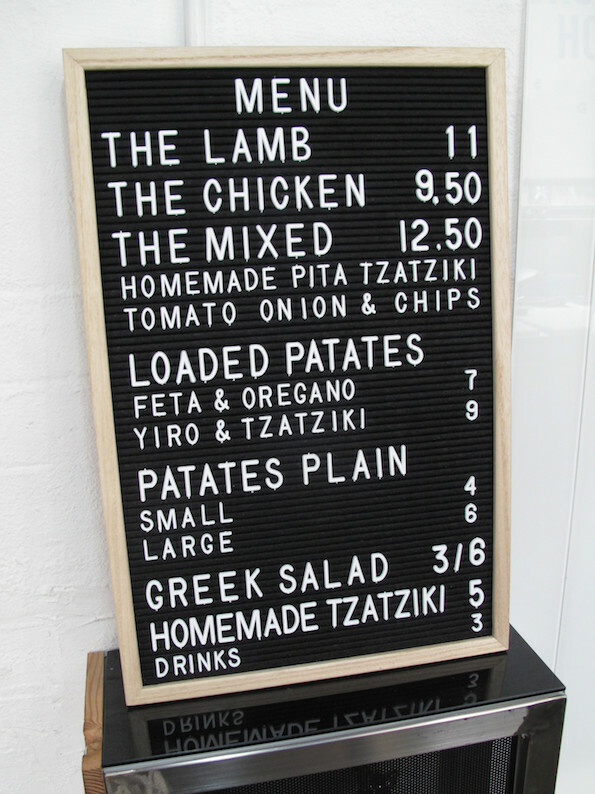 But there is much else and our lunch desires this Saturday are simple. 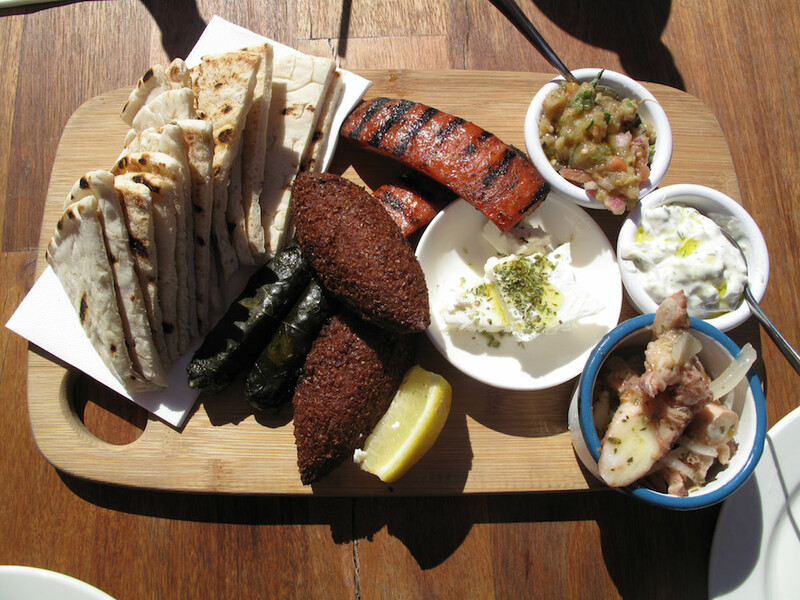 So we go with the meze platter for two ($32) and are delighted. Toasted pita bread, of course. 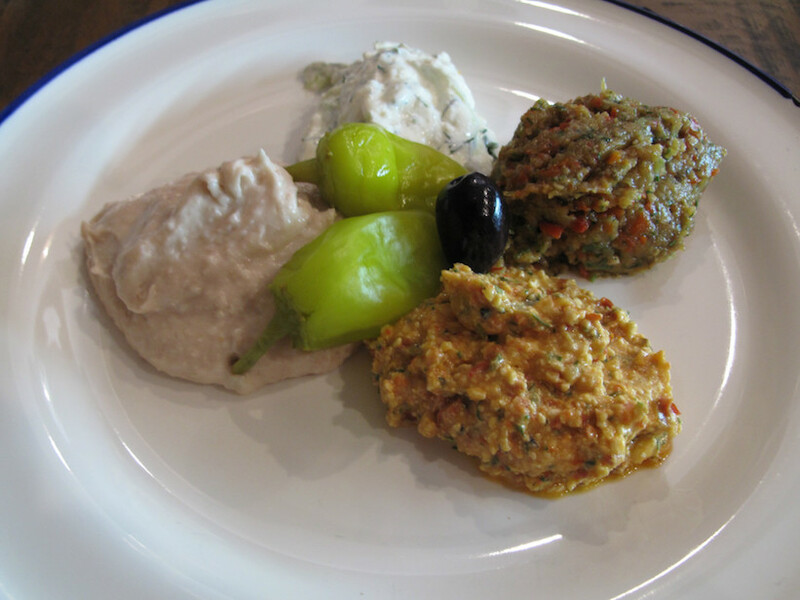 Two dips – a dill-perfumed tzatziki and a chunky eggplant number. 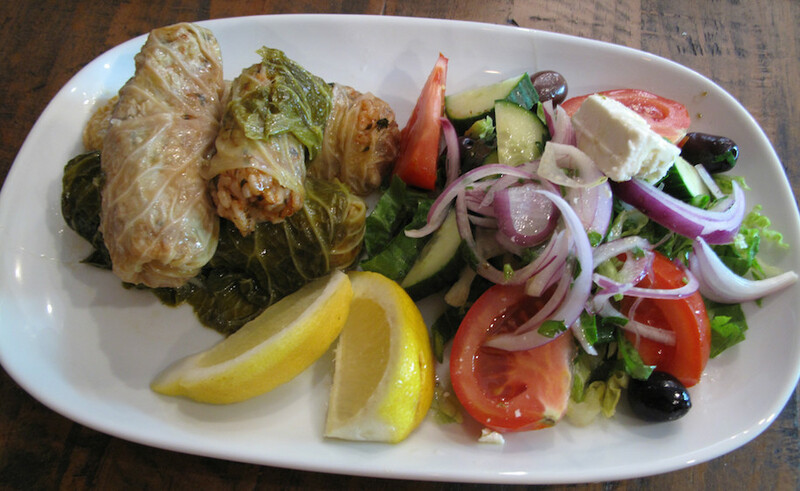 A couple of good stuffed vine leaves. Pickled octopus that is all the more enjoyable thanks to its chewiness. 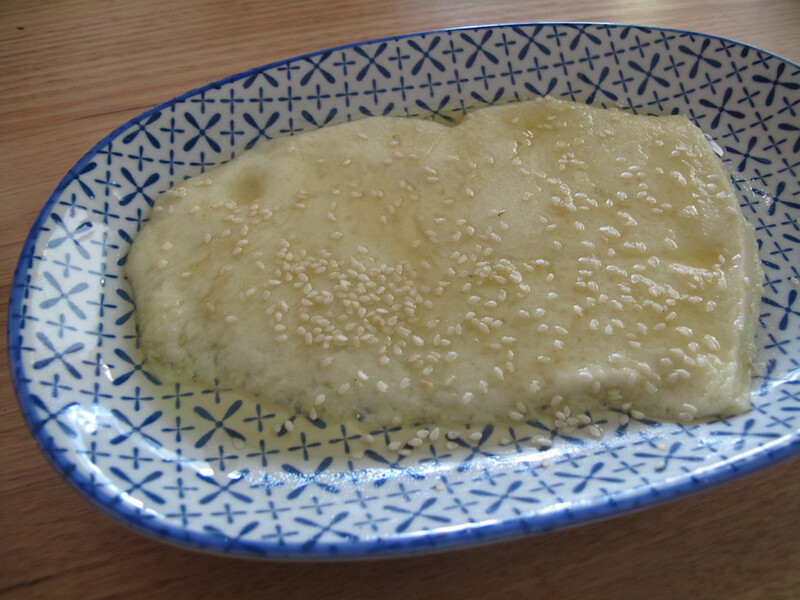 Best of all – two koupes, more widely known as kibbeh. 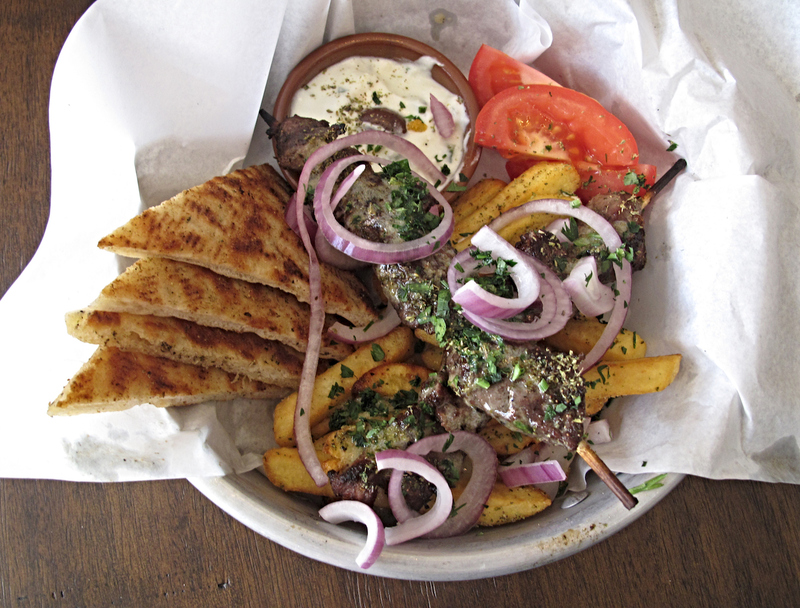 They’re fantastic deep-fried torpedoes of bulghur wheat encasing a juicy mix of lamb, onion and seasonings. 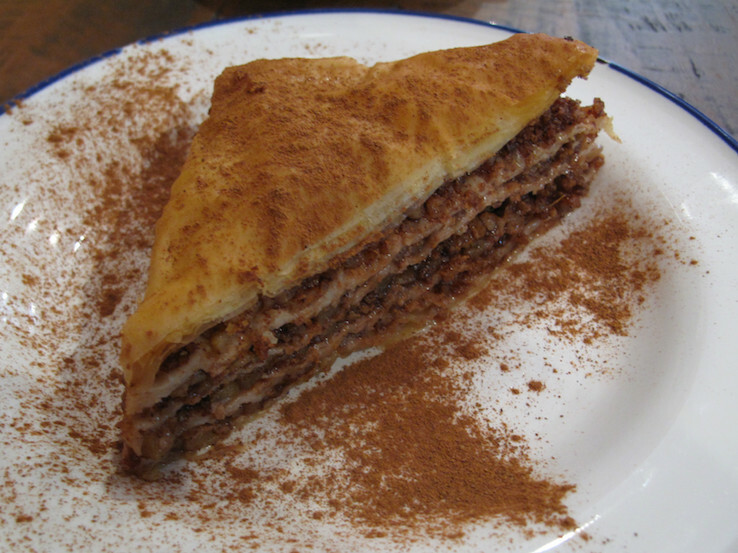 Galaktoboureko ($6) is rich, quite heavy, delicious, but a bigger serve than either of us is capable of consuming. 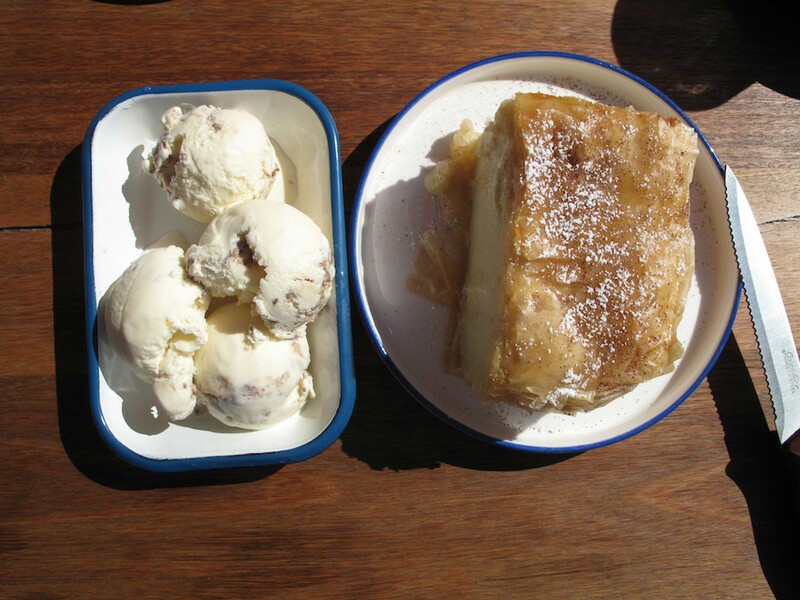 It’s overshadowed by the house-made halva ice-cream ($8.5). This combo of vanilla ice-cream and crushed choc halva sounds like it could be a mishmash, but the outcome is divine in the way it combines both flavour strands. 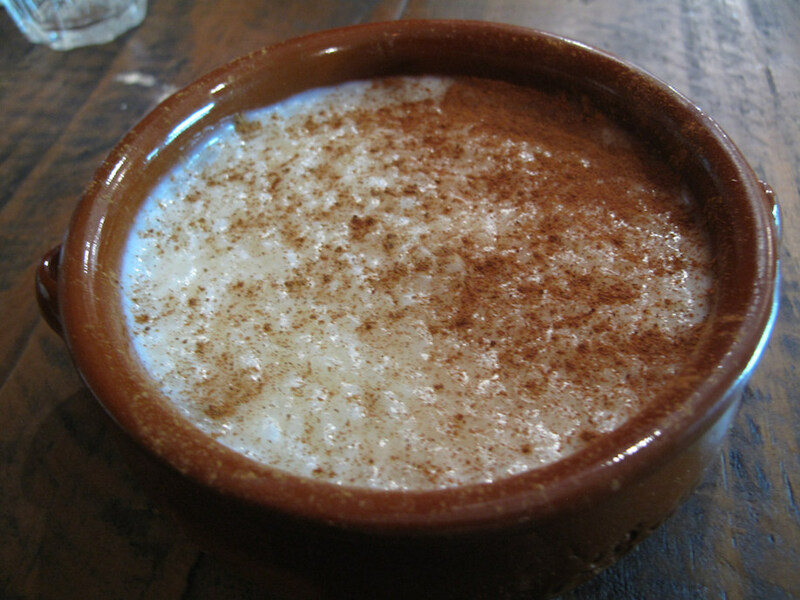 Our cafe lattes are excellent. 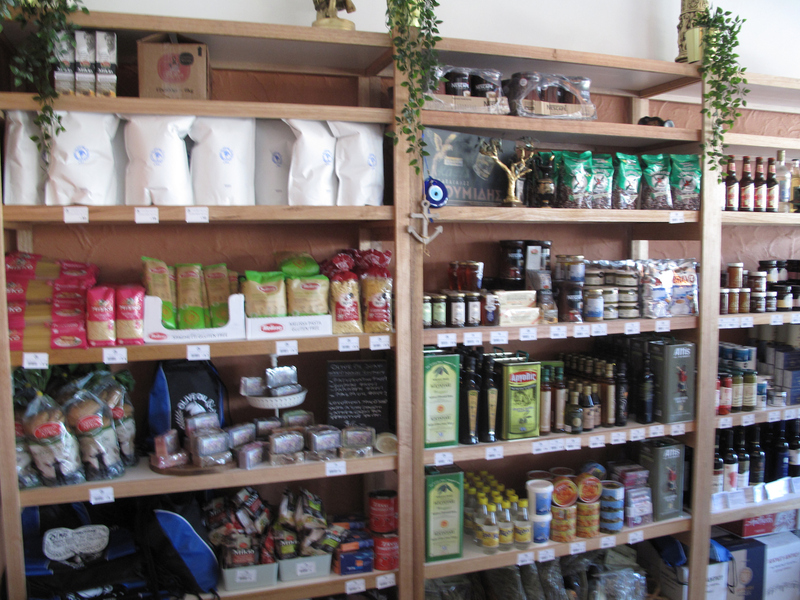 See the Xenia Food Store website here. 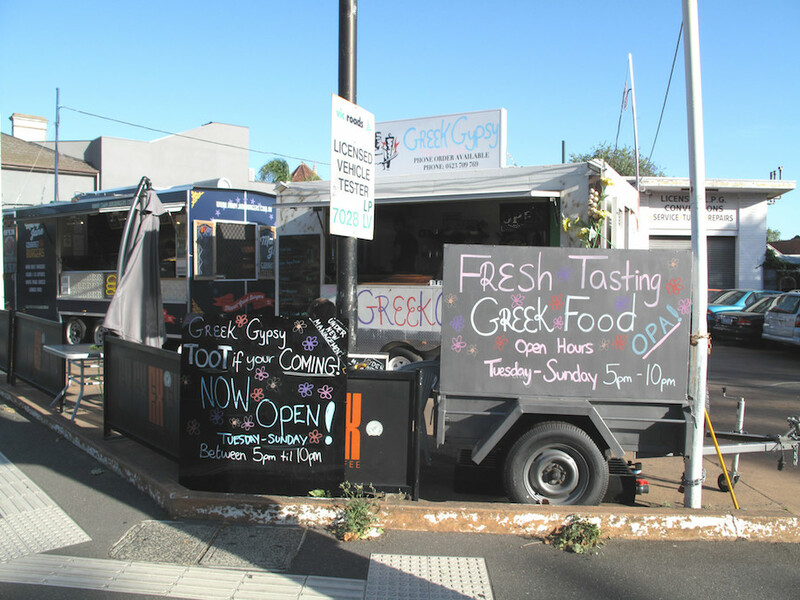 For newly arrived residents or casual visitors, the Greek heritage of the inner west – particularly in Seddon and Yarraville – can seem, no doubt, near invisible. Look a little harder, though, and it’s right there all around us. 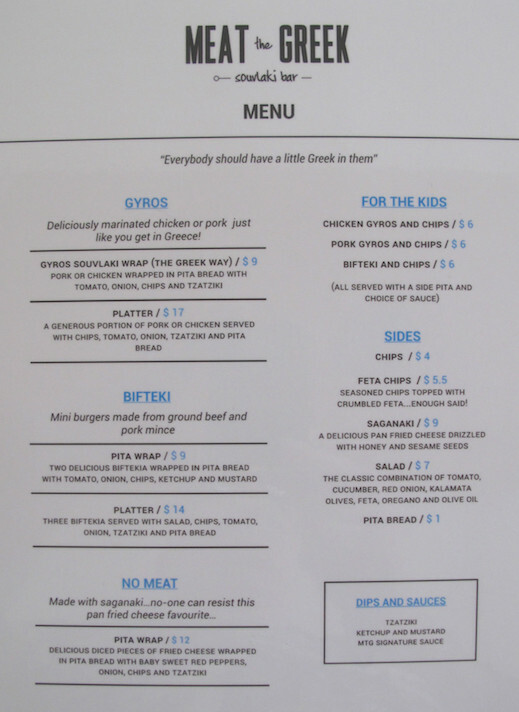 So the opening of a trio of Greek eating establishments is not so much something new as a continuation of deep heritage. 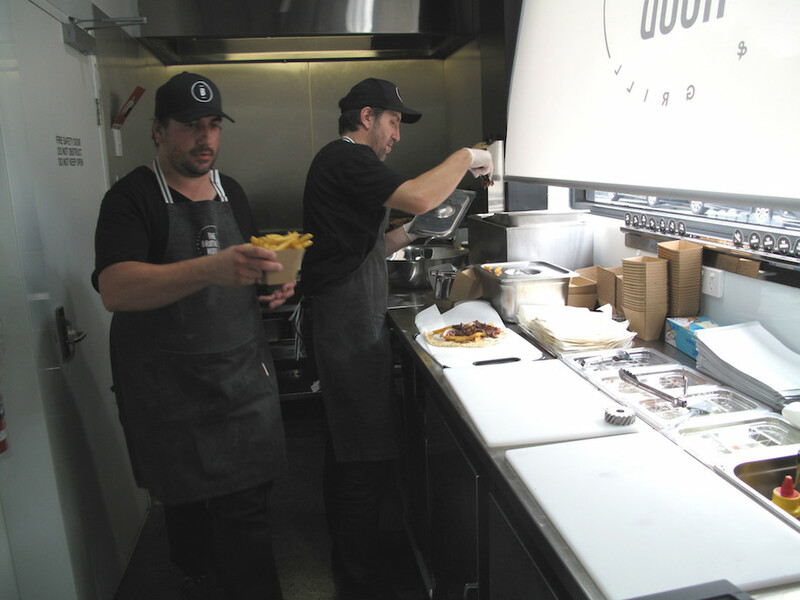 We have no news about the schedule of the Brother Hood Yiros & Grill off Buckley Street. 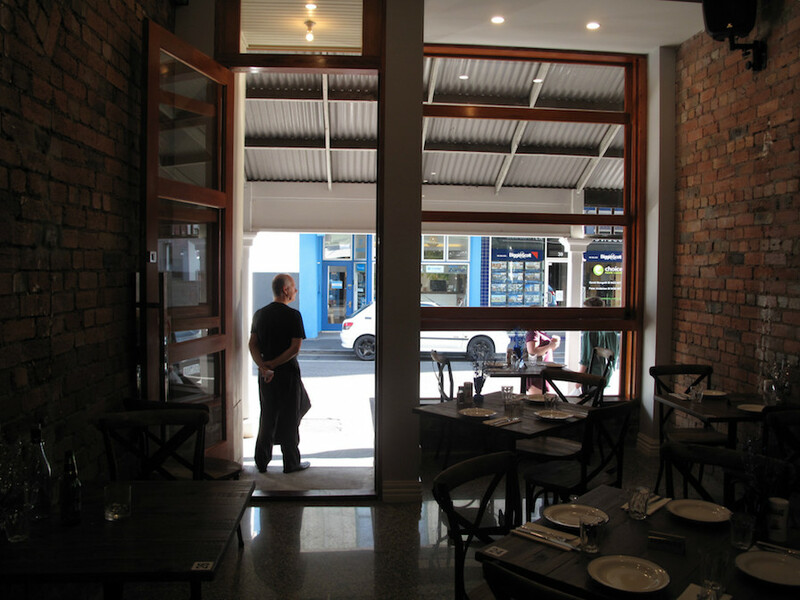 We do know Eleni’s in Yarraville is, after a slow start, coming along nicely. Progress views on what looks to be a spectacular fit-out have been available for the past week or so to passers-by on Anderson Street in Yarraville. 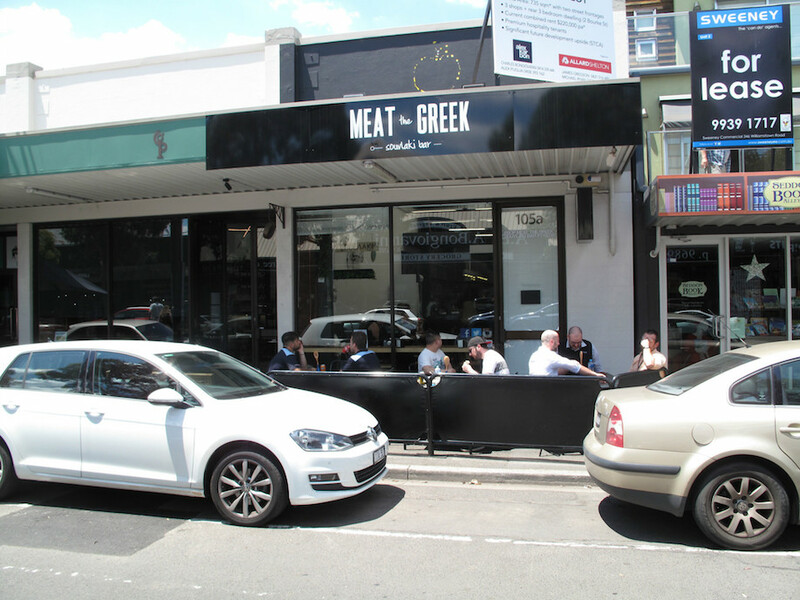 But it’s Meat The Greek in Seddon that is first cab off this particular rank. 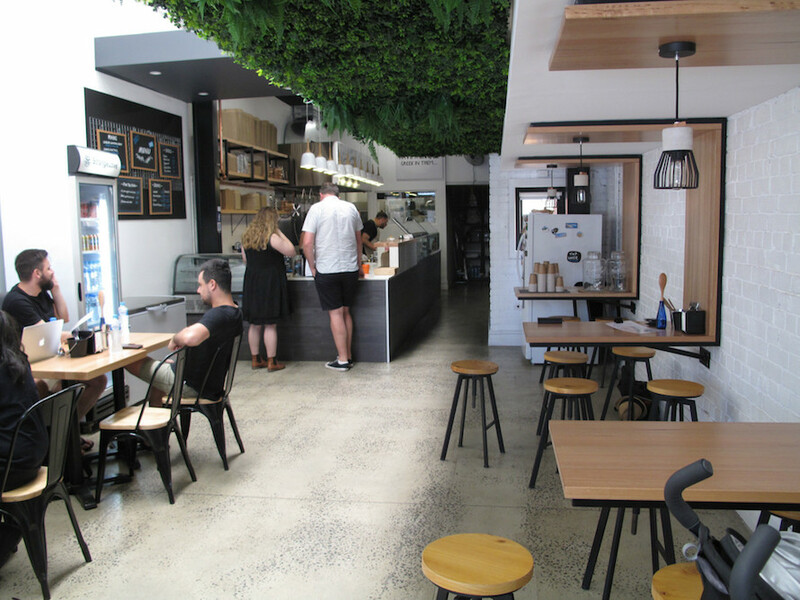 We – CTS No.1, good mate Justin and his colleague Dayna – hit it on opening day, along with a good number of like-minded hungry and curious souls. 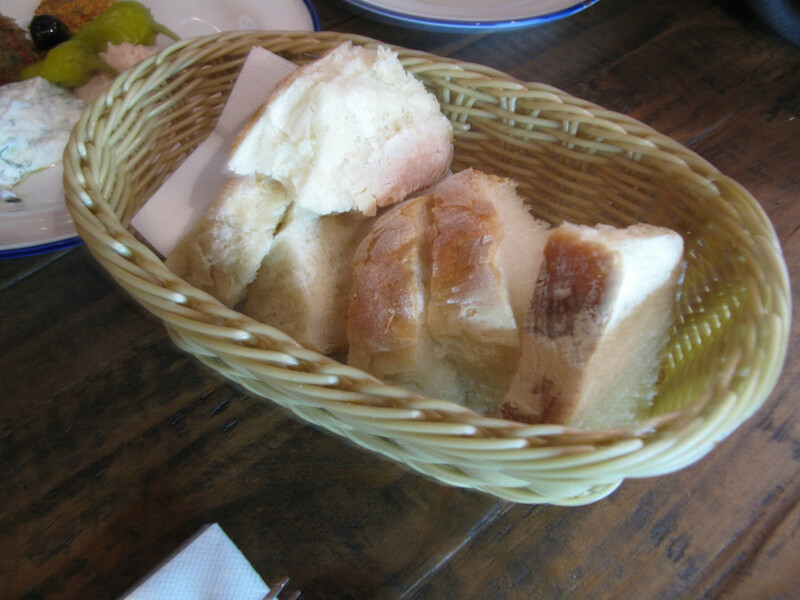 And a very nice lunch we have, too. I feel obliged to record here the minor wrinkles we experienced. But given the place had been open barely an hour, I also recommend taking no notice of them. 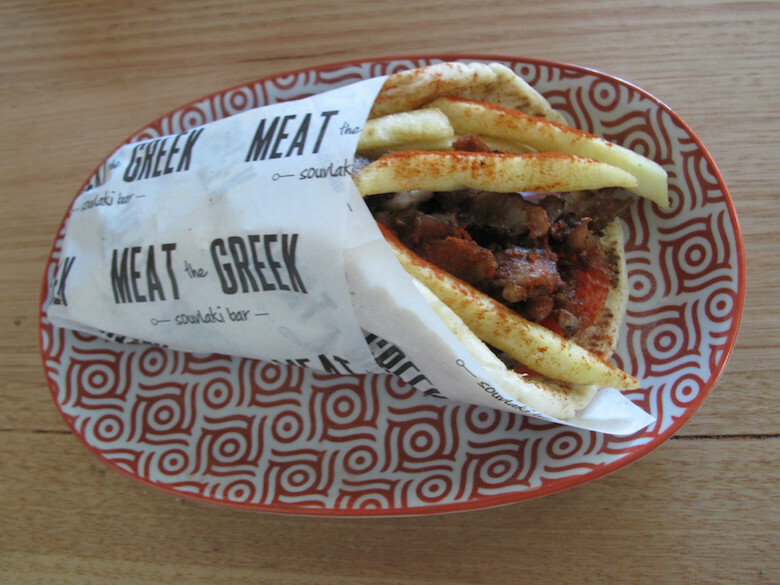 Indeed, Facebook reviews strongly indicate the Meat The Greek crew is already running right up to speed and doing fine. 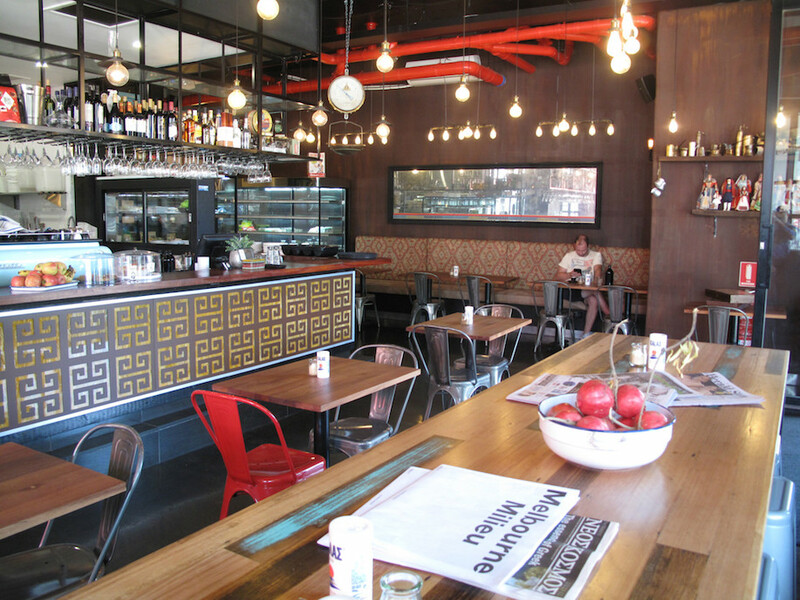 The place is done out in simple, bright and cheerful cafe fashion. 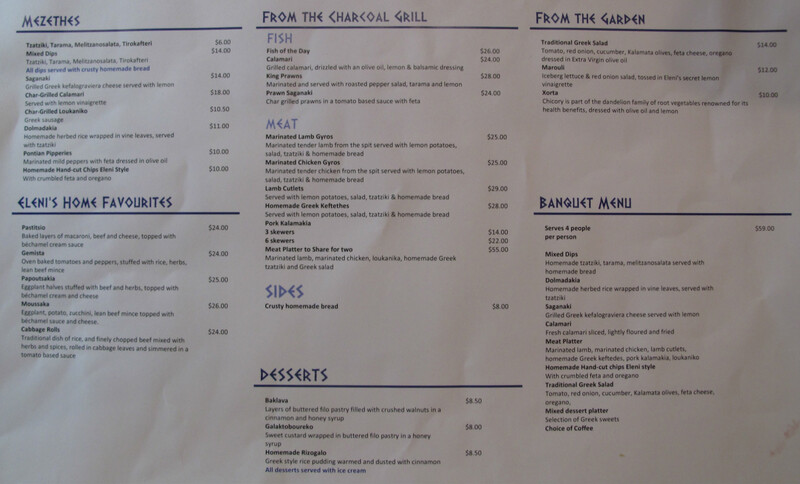 The menu (see below) is just how we like it – succinct and listing very low prices. … pork for Justin and I – were good. 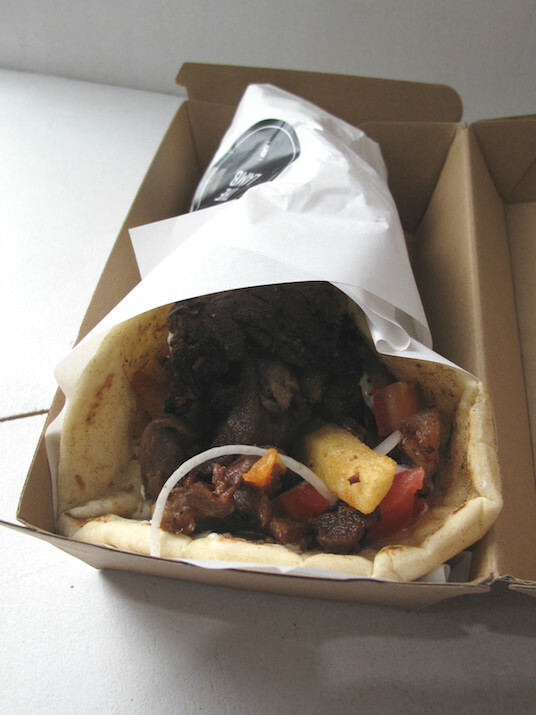 These were very much in the Greek street food style, so are not really in your two-fisted, bulging-with-meat bag. 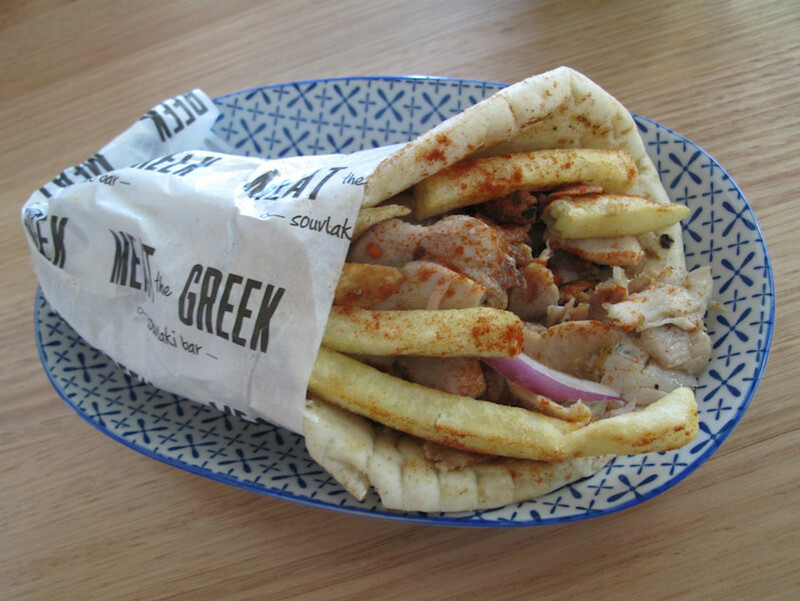 But the meat is fine, abetted by a handful of chips and good dressings and salady bits, all stuffed in that puffy-style pita. They were good value for $9. 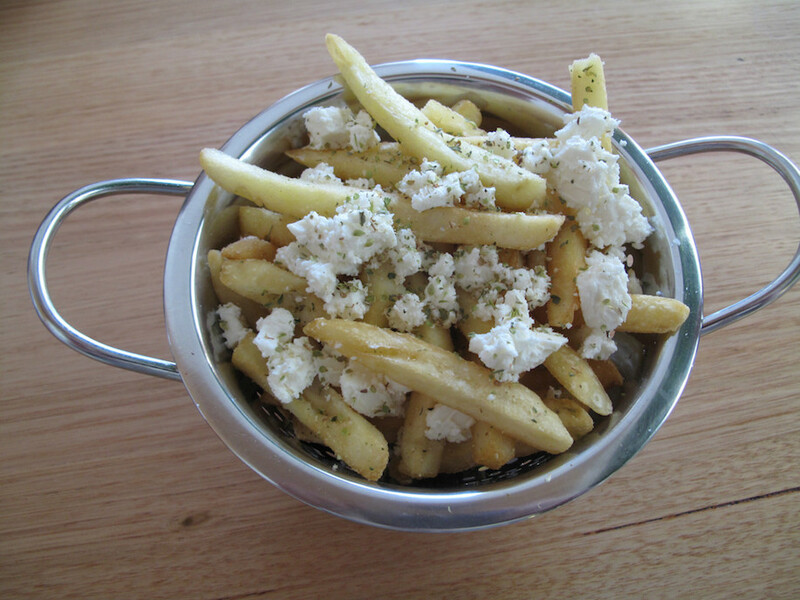 Are feta chips a new or an old thing? We don’t know, but we reckon it’s a brilliant concept. 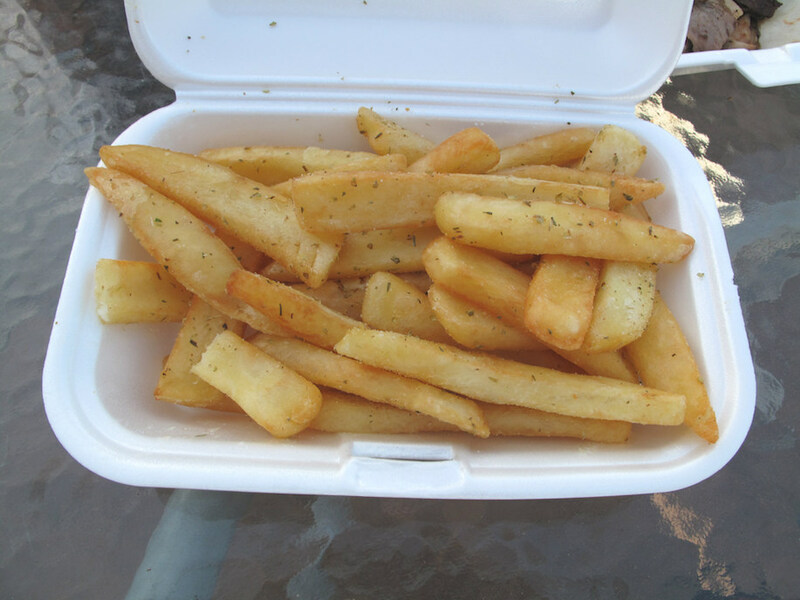 These ($5.50), though, could have been a bit hotter. This was Dayna’s first experience with saganaki. But, of course, saganaki IS salty. This one ($9) seemed to have been a bit of a rush job. 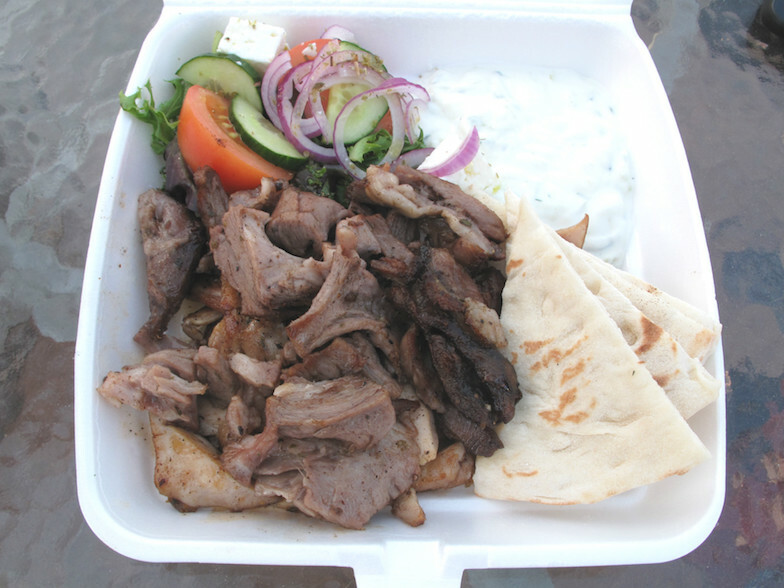 As well, by the time the last souvlaki had reached our table, a half hour had elapsed. 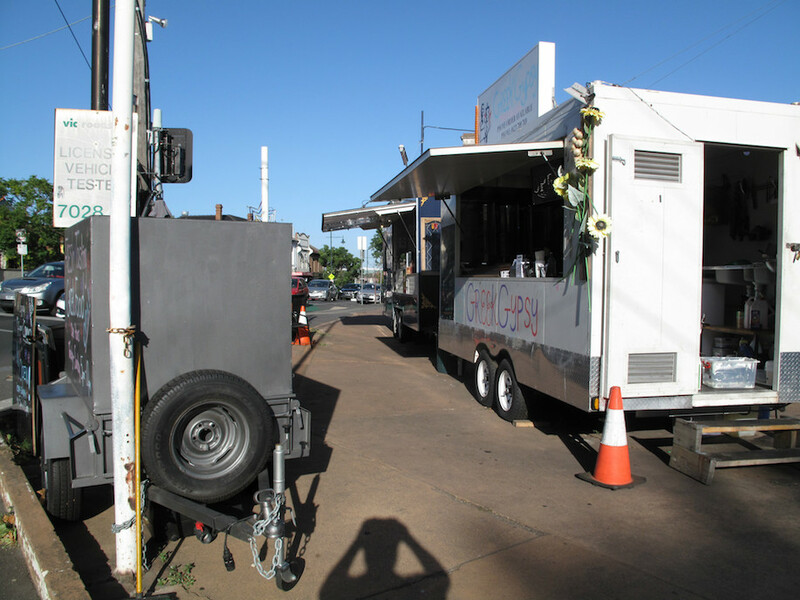 But – as noted above – we were happy to be opening-day forgiving given the quality of our lunch. We’ll be back – and I know Bennie will love this place. 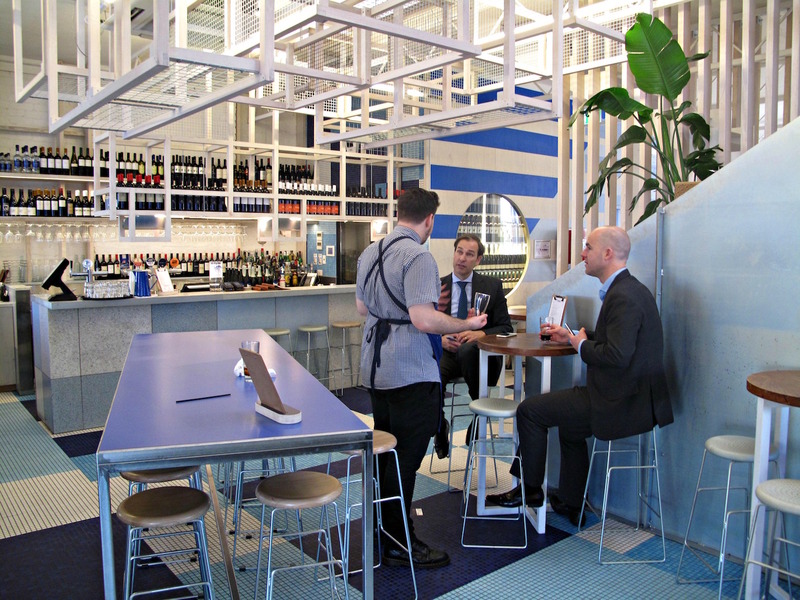 After participating in the opening rituals of Hellenic Hotel, I am super keen to try on the joint’s upstairs bar $15 daily specials. So much so, I bound up the mid-week stairs. 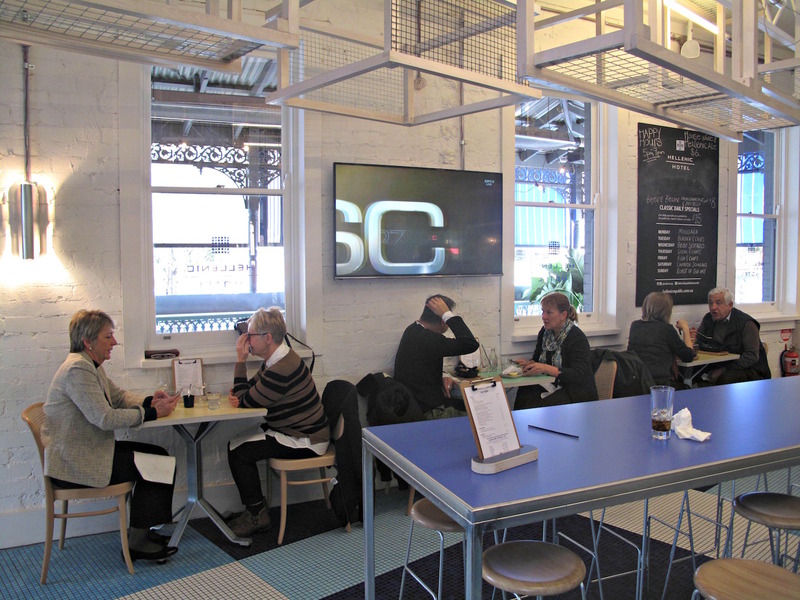 The bar area – excluding verandah – is quite compact, featuring three tables for two, a couple of tall tables with stools and a communal table, also with stools. 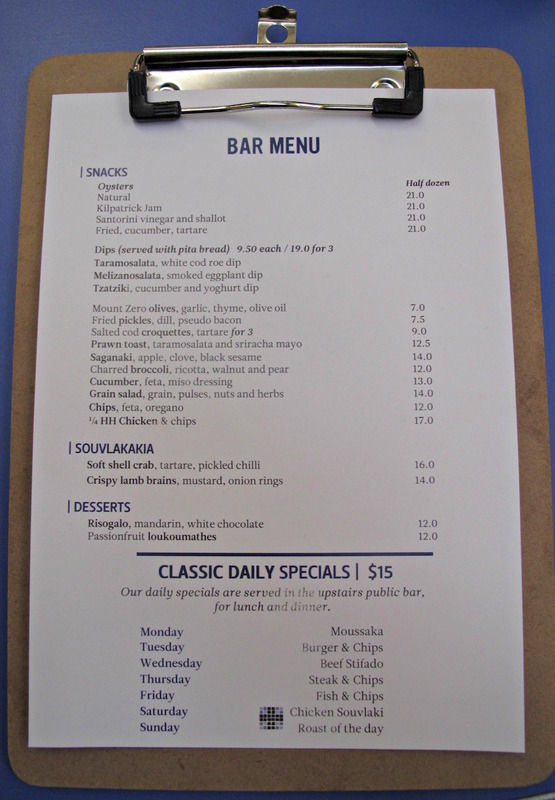 The bar menu (see below) features a range of snacky-type dishes through to those with a bit more heft, such as 1/4 HH chicken for $17. 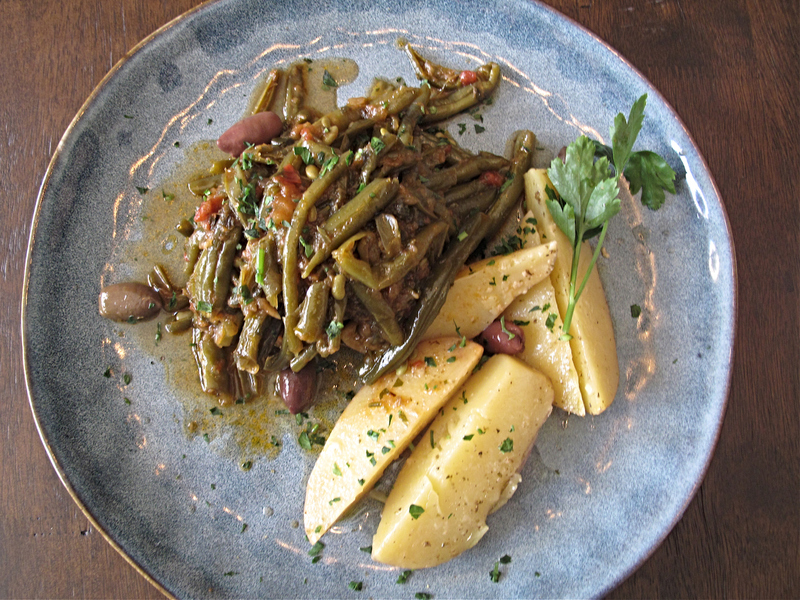 There’s a daily special allocated for each day (also on the menu below) – and based on the excellence of my Wednesday beef stifado, I definitely want to try them all. My beef stew is marvellous. 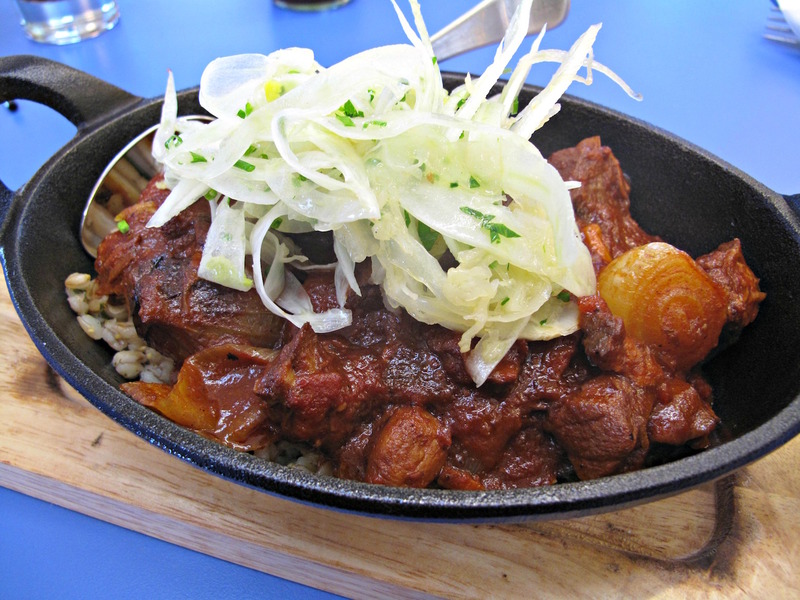 The serving is of a good size and the sticky stew features not only heaps of very good beef chunks but also halved baby onions and carrot. They all sit atop a bed of barley that is puffed up yet still nicely chewy. Topping all is a fistful of of fennel salad that provides nice contrast. 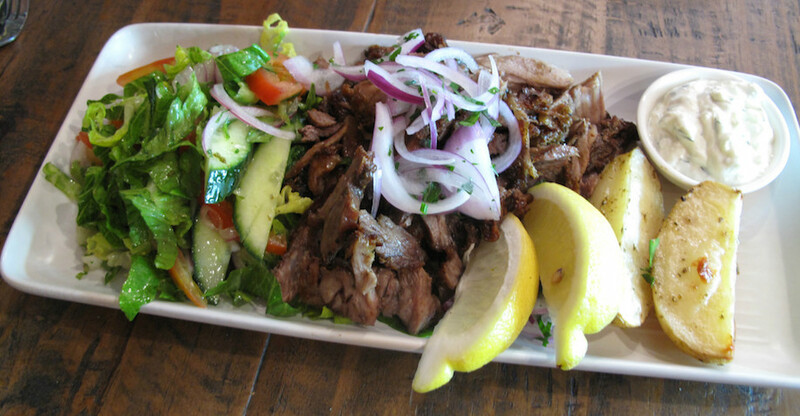 It’s a delicious lunch and very good value for $15.